Attorney is a lawyer website HTML5 template designed intensively for law professionals. It contains necessary sections needed in a law agency website. If you are looking for a high-quality all-in-one lawyer website HTML5 template, Attorney is the one you are looking for, which is a responsive bootstrap template designed with HTML5, CSS3, Bootstrap 3, and jQuery. This is a clean and straightforward, yet elegantly designed HTML5 template for an attorney, lawyer or law firm websites. Not only that, but it can also be used as an agency website template after customizing the text and images. Many people using this template as consultancy firm website. The first and most important visual feature that a law firm website should ensure is- it has to be minimal and informative, but at the same time- elegant. We, the ThemeWagon team ensure that the design is clean and the user interface is simple so that the visitors feel comfortable while browsing your lawyer or law firm website and subconsciously feel a sense of faith in you. Millions of people are buying smartphones each quarter. The number of website visitors from mobile devices is regularly increasing. Most of the websites which are old are not mobile friendly. So it’s time to make your site responsive. Using Attorney – a Lawyer website HTML5 template you can make your website friendly for both desktops and all kinds of handheld devices. This is a 100% responsive bootstrap template, which will work correctly on mobile phones, tablets, iPads, etc. This elegant multipage Lawyer Website HTML5 Template is designed to ensure the website’s visitors as much as information with the least possible navigation. It is obvious that it is nearly impossible for anyone to project a lawyer’s or law firm’s attributes and achievements in a one-page website. That’s why, in our last updates, we have included a few pages that are indispensable for any law agency website. So, we will strongly suggest you avail the Premium version of this Lawyer Website HTML5 Template and enjoy its full capability. 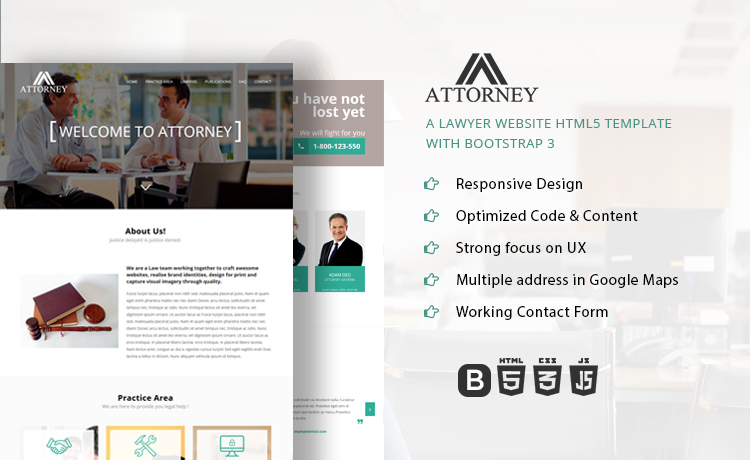 Attorney, the Lawyer website HTML5 template was coded by one of our best coders. He coded this Lawyer website HTML5 template error free and well documented. It has perfect indentation which makes this Lawyer website HTML5 template a flexible and easily customizable template. Not only that, if needed, you can Contact Us for help. We would love to hear from you and help you out. Subscribe to our email newsletter to get the updates of our new templates and latest updates. Don’t worry; we will never spam you. The attorney is an SEO friendly lawyer website HTML5 template. All the HTML codes are validated with W3C. It has titles and meta tags integrated. All you need is to replace them with your own. We hope you will like Attorney – the Responsive Lawyer Website HTML5 template and find it useful. Know someone who would be just as stoked as you are about Pebble Time? Share our campaign with them through the “Share this project” button at the top or below. Sharing is caring! I am impressed to see how sincere the design is. Every detail is so perfect. And yeah, the custom graphics are so well done. I am waiting for the WordPress version. Beautiful theme, and excellent for the clients. I've bought this template for my project. I had needed some help to customize it. Then, I had contacted with the developer team. They gave quick support! I recommend this template. This template is too much Desirable. Befor I purchased the template, it had awesome animations on showing various elements, now it is purely static, some of the templates have these awesome animations still… how can I fix that? Anyone know the proper set up for the contact.php file? I’m having trouble displaying the senders email address in the email I’m receiving for contact form submissions. And I cannot get a “success” validation message for the form itself. It keeps jumping to the top of the page when submitted. We have updated this template and now you will get more features with php files. “Hamburger” is not working in mobile devices, any idea to fix that?